Teddy Started It! : Thank You Thursdays! OK, so it's not Thursday. Well...I suppose you might be reading this on Thursday, so maybe it's Thursday for you, but it's not for me. For me it's Blogday, which is Sunday -- or at least Sunday used to be blogday for me. I broke my streak last week and didn't get a post up. Since no one harassed me about it I'll assume it didn't ruin anyone's week. Thank goodness because that kind of pressure's just too much for me. Anyway, back to Thursday. I've decided to add a regular Customer Appreciation feature to my blog and I'm thinking about doing it on Thursdays. I've had some really great customers since I started this Etsy thing, and it's time to share the love. So, starting next week I'll be introducing you to the great folks who've bought my stuff. Before I get started, I need a little help. I really feel like I need a catchy name for my feature but I'm at a total loss. I don't know if it's the heat, the creative drain of keeping the kiddos happy during the summer, or what. I feel like I don't have a clever bone left in my body. So I'm going to let you all do the work for me. Great idea, eh?!? Here's the deal: YOU come up with the clever feature name for me...I'LL send you a little prize. I'll even let you pick your prize. You can have a pot of my Once Bitten after bite treatment or you can pick a penny pendant from my FlutterbyGirly etsy shop. It's a win/win!! Now for the details. Leave a comment with your idea of a great customer appreciation feature name. Also leave your choice of prizes and a way to contact you. Easy, right?! As for the feature name, it can be anything that gets the point of appreciation across. It may or may not include the day of the week. I'm not married to Thursday either. I only selected it because it begins with TH - just like the word "Thanks". Get it? THursday...THanks.... (See what I mean about creative-drain?) I'm open to just about anything as long as I don't have to do the brain damage. My brain's damaged enough. My choice of prize (I'm not holding my breath, cause my ideas weren't so great!) 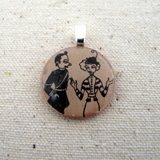 would be a cool penny pendant, since I already have a stash of your awesome cream! The first thing that popped into my head was "You're the Bestest!" So . . . yeah. There ya go! 3. Thanks a Teddy Ton! 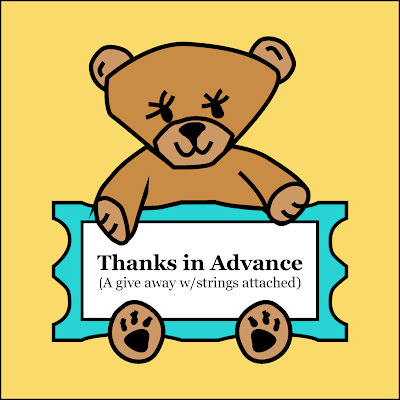 'Bear Bows' or 'Bear takes a Bow' kinda like acknowledging the applause....i know its not the most creative one, but i think it would be the perfect way for teddy to thank the world! If i win, which i really hope i do, but am not too confident of, i would decide on a penny pendant since i am going through a pendant obsession right now!